Who knew that geometry could be this fun? Depart from regular squares and rectangles, and opt for the natural shape preferred by bees, snowflakes and turtles. The design is simple, but it inspires complex thinking. 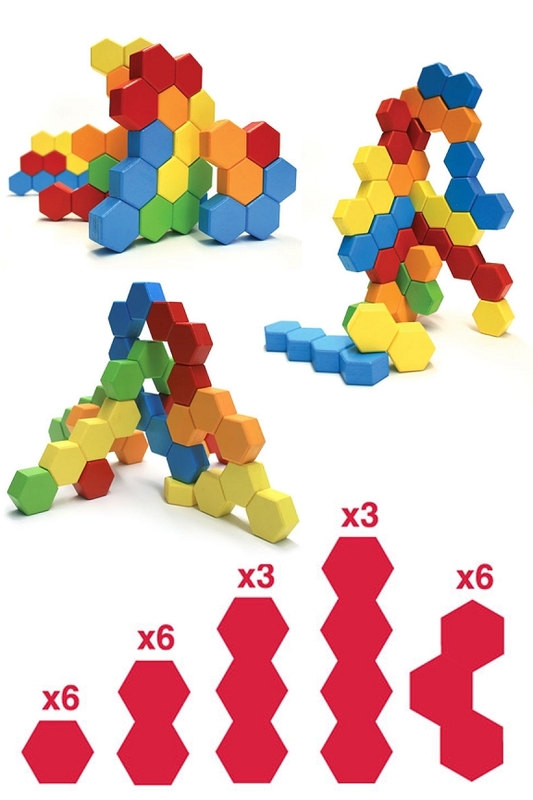 Children can build horizontally or vertically, and precise placement will allow the pieces to stack and combine to create all sorts of towers and designs. The end result will be an awesome looking structure that curves through space, and appears to defy gravity. When finished, it looks like individual hexagons were used to build the whole thing, but singles only make up six of the 24 pieces you get. 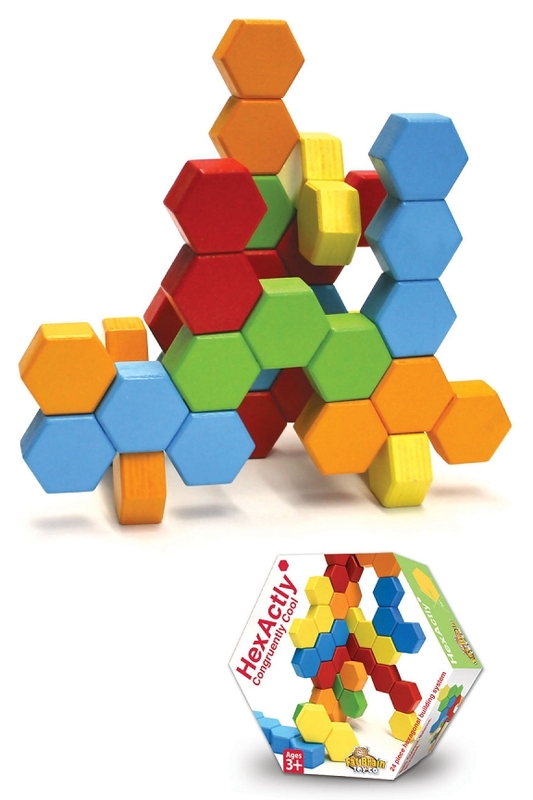 The other blocks are larger, and they combine several hexagons together in different configurations. This makes the impossible possible as individual parts look like they should slide down, or fall off, but they remain perfectly in place, and totally rigid. Each chunky piece is easy to manage with small hands, and the open ended play is perfect for young and old kids alike. Little ones will balance and pile to learn basic skills, and bigger ones will test the limits to design incredible contraptions. Don't settle for up and down stacking. Get this building toy instead, and watch as the things they create climb through space at every angle imaginable. 6 doubles connected in a straight line. 3 triples connected in a straight line. 3 quadruples connected in a straight line. 6 triples in a triangular, offset pattern. Endless Possibilities. A nearly endless amount of placement options easily allows for thousands of design possibilities. Let children start out simple, then challenge themselves to see what's possible. Bright Colors. A vibrant finish with a range of colors makes the resulting creations beautiful, and the bold pieces draw kids instantly. Chunky Pieces. Perfect for small hands to develop large minds. The over-sized blocks are easy to work with, but they also allow for complex creations. High Quality. Made from natural wood, and then coated in a safe and attractive paint. These durable blocks will last for many years of fun. Educational. Teach kids about geometry, but also have them learn construction principals, creative thinking, fine motor skills and more. Included Extras. A building guide completes the set, and also includes fun facts about hexagons in nature and mechanics. Open Ended. With no one way to stack or combine, children will think of their own "right way" to build. Hexagon Dimensions 1.25" x 1.5" x .75"
Uses Stack and build to create geometrical designs that are truly unique. Combine horizontally or vertically for a wide range of possibilities. # Pieces 24 Block in Total. 57 Hexagons in total. Get 6 singles, 6 linear doubles, 3 linear triples, 3 linear quadruples, and 6 non-linear triples. 2011 Parents' Choice Recommended Award Winner! Build incredible looking structures with these geometrically brilliant pieces. With six sides instead of less, pieces join together in a multitude of ways. With bright colors and a variety of configurations, it's sure to please. Order Yours Today! My 4 yr old niece opened these right away and immediately began playing. They kept her attention for almost an hour, and she returned several times throughout the day. She loved them, and I was very pleased with the quality and the stimulation of intelligence.